At the end of 2007 Yamaha Thailand launched a duck sporti motor (super moped), called Yamaha X1-R. 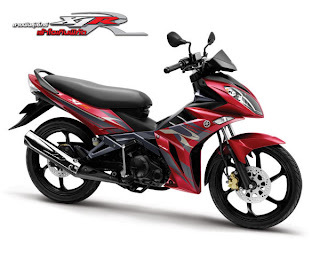 Using a 135 cc engine capacity, such as that used Yamaha Spark RX-135 (Jupiter MX in Indonesia, 135). Ie type spefikasi engine with 4 steps, SOHC, 4 valve (berpendingin liquid) with a two-disc brakes front and rear. Sasis the same with the RX-135 Spark. Segment at the biker is a spirited young and want to display more motor sporti from the preceding. Design body changed more futuristic and the use of visible light to look stupid and sporti Macho. Yamaha manufacturer to apply the same strategy but the base motor is used by two different models such as the Yamaha Mio and Mio Soul. This strategy to meet the demand of certain segments, with the price than have to re-create research. In addition the engine was developed jointly between the manufacturer in the Yamaha Asean ensure availability of spare parts. Is this motor would be present in Indonesia? Rumor PT Yamaha Motor Kencana Indonesia is also planning to issue their latest motor. As the slogan for The AT HOME away, so do not lag up to the competitors with the already issued senjatanya, itupun Honda has not issued all the new products in 2008 that will appear soon. Rumor is circulating that Jupiter MX variants will have changed the form and will be using injection technology. We wait presence X1R Yamaha 135.